15.4.2019 RAGNARÖK FESTIVAL COMING UP SOON! 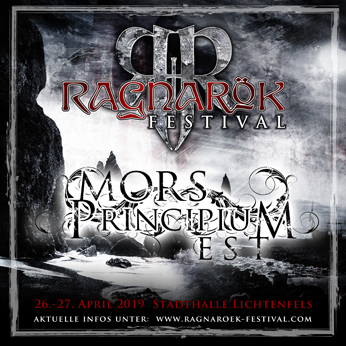 Only less than 2 weeks for our show at the RAGNARÖK Festival in Germany! And the date of the show is April 27th, 2019. 19.11.2018 70000 TONS OF METAL CRUISE nr2 CONFIRMED! 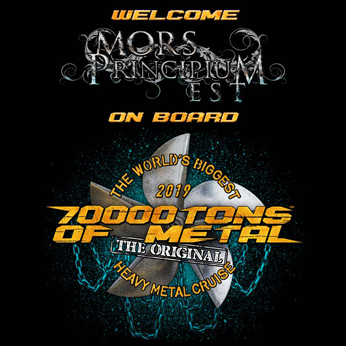 We are more than happy to confirm that MPE will return to the "70000 tons of metal" cruise. This time the dates are January 31st - February 4th, 2019!!! Best of times ahead, again! 7.9.2018 NEW EUROPEAN BOOKING COMPANY! 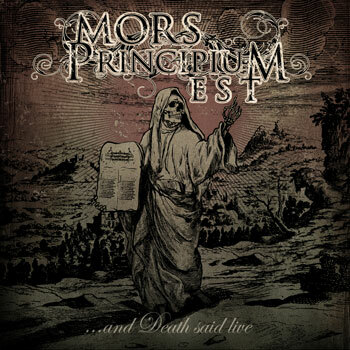 Mors Principium Est sign a booking agreement with Doomstar Bookings for European territory! We are more than thrilled to start working with Doomstar Bookings for our European live dates. 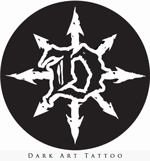 After many conversations with Benny from Doomstar, we feel that Doomstar Bookings is the right company for MPE. Doomstar Bookings have a very strong roster and it is an honor to be a part of that roster. We can't wait to get back on the road in Europe! 4.7.2018 NORTH AMERICA 2018 TOUR! We are more than thrilled to announce our first North America tour! 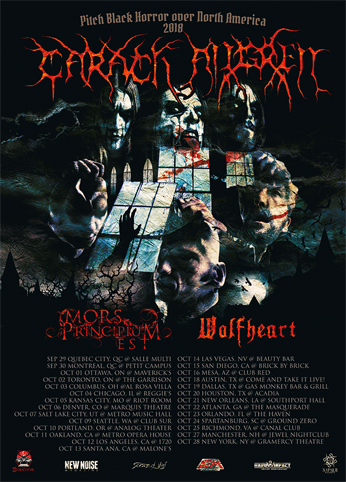 We will tour USA and Canada with Carach Angren and Wolfheart. 10/18/18 Austin, TX Come and Take it Live! 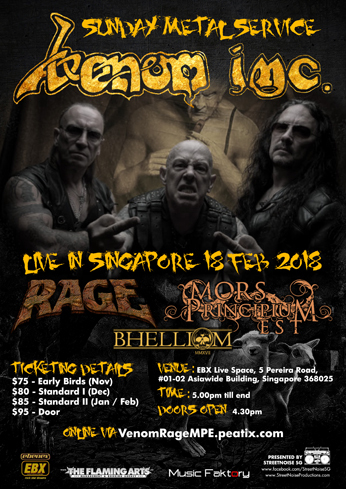 We will play in Singapore for the first time. We are more than happy to announce, that once again we are going to tour the amazing Japan! We are happy to announce that we will play, for the first time ever, 2 shows in Russia! November 28th in St.Petersburg and November 29th in Moscow. 5.10.2017 KARMØYGEDDON METAL FESTIVAL 2018! For the first time we will play in Norway! We will play at the Karmøygeddon Metal Festival at May 11th, 2018. 24.12.2016 70000 TONS OF METAL CRUISE CONFIRMED! 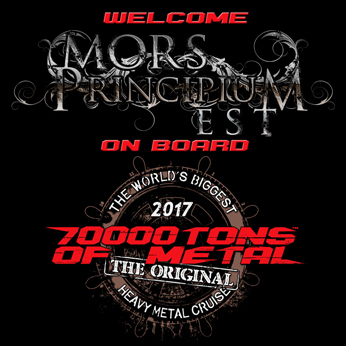 Finally we can confirm that MPE will play at the "70.000 tons of metal" cruise on February 2-6, 2017!!! 18.12.2016 NEW MUSIC VIDEO ONLINE! We have just released our new music video for the song "Reclaim the Sun", from the "Embers of a Dying World" album. Go check it out people!! 2.12.2016 PRE-ORDER THE NEW ALBUM! It is now possible for you to also pre-order the "Embers of a Dying World" bundle (album + t-shirt)! Bundle and t-shirt and CD digipak available. Bundle and CD digipak and vinyl available. CD digipak and vinyl available. 13.11.2016 ALBUM RELEASE DATES ETC. Here is the beautiful front cover artwork for "Embers of a Dying World" painted by Eliran Kantor (Testament, Iced Earth, Sodom). Album will be available as Digital, CD, Digipak and ltd. gatefold red-black marbled Vinyl (500 copies). The new album will be called "Embers of a Dying World". It will be released early 2017. You can check the studio diary part 1 while waiting. Part 2 and more info about the release will follow later! 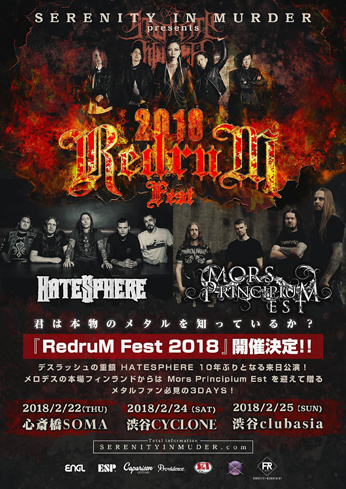 We will play 7 shows in Asia with Omnium Gatherum. We are happy to announce that we are part of the "AFM Label night" at the Rockharz Open Air festival at july 6th in Ballenstedt, Germany. We are more than happy to announce our European tour at september with Onslaught, No Return and Blaakyum! See you people on the road! with CONTINENTAL CONCERTS USA www.continental-concerts.us for North America, Central America and South America territory. And at the same time we are happy to announce that we have signed a booking agreement with RISING TALENT AGENCY www.rising-talent-agency.com (an affiliate of Rock The Nation) for Europe territory. 2.8.2015 SPANISH TOUR + NEW ALBUM INFO! For the first time in our history, we are coming to Spain! And did we settle for only one show? No, we will play 5 shows for you great people of Spain, starting at november 11th. We will share the stage with the local support bands Dysnomia and The Descent. Also, we have started to write/compose the album number 6! It's time. Thank you all for your patience building up to this big moment in MPE's history. Here is our first ever music video, single and the first song you'll hear from our new album!! 1.9.2014 NEW ALBUM RELEASE DATES! It is our pleasure to let you know, that our new album "Dawn of the 5th Era" will be released in Japan at november 19th and in Europe at december 5th! It is also our pleasure to announce that we will have our first gigs in Japan as the headliner, during december 2014! We will play the following 6 gigs during august. We have some new merchandise available! We have some news to you people. Andhe had to go back to New Zealand, so for personal and practical reasons Andhe will be replaced by mister Kevin Verlay. We wish all the best for Andhe and his future projects. Some of you may have already seen Kevin playing with us as Kevin played on our Japan tour and on our European tour. So let us warmly welcome Kevin on board and let's hope this line-up lasts. 3.1.2014 UPDATE ABOUT THE NEXT ALBUM! We think that now is the right time to let you know, that we will start to record our next album in May! We are planning to release the album later this year, the exact date will be announced later. TIME FOR AN EUROPEAN TOUR! Arsis had to pull out of this tour, so we have joined last minute. Come check us out over the next few weeks across Europe! We also have our special friend Kevin on board with us once again. Dates below. We have confirmed some livedates in Finland and in Japan. More info about those can be found at the "LIVE" section. We also signed an European booking deal with TheFlamingArts, so from now on, all our European gigs will be handled by them. There are plans for an European tour during this year, but more info about that will be released later. Soo, if you want to listen to every song before you get your own copy, now is your chance to do that! There is a new pre-order package available in our merchstore! 5.11.2012 1st EPISODE OF STUDIO DIARY AVAILABLE! Hey, go check the 1st episode of our studio diary! 27.10.2012 THE TRACKLIST OF "...AND DEATH SAID LIVE"! ...it is time to release the tracklist of "...and Death said live". 09. What The Future Holds? 19.10.2012 FIRST SINGLE FROM THE NEW ALBUM RELEASED! Now you can listen the first full song from our upcoming album. The song is called "Destroyer of All", go check it out! The new album "...and Death said live" will be released in December 2012, via AFM Records (Europe/USA), Marquee/Avalon (Japan/Asia) and Truth Inc Records (Australia). Featuring guest appearances from our friends Ryan Knight (The Black Dahlia Murder) and Jona Weinhofen (Bring Me the Horizon/I Killed the Prom Queen). Thank you all for continuing to support us, we can't wait to share this new album with you! 30.6.2012 The recordings will begin! Tomorrow (1st of july) it starts, the recordings of our 4th album! 27.4.2012 WE SIGNED A DEAL WITH A NEW RECORD LABEL! 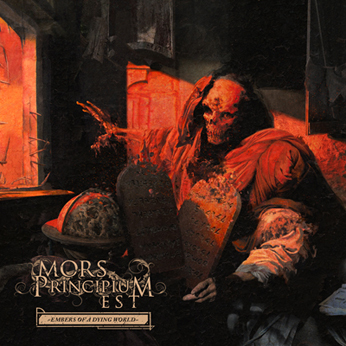 This is Ville from Mors Principium Est. I am more than happy to announce, that MPE signed a deal with AFM Records for Europe & the US. We talked to some other labels too, but AFM seemed the right choice for us. We can't wait to get to the studio in the summer and release the new album at the end of 2012. And then we will see what happens, when the people of AFM starts to work their magic. We have been talking with a record label for Japan, Korea and Taiwan release, everything seems ok, but nothing has been signed yet. Also have been talking to a record label for Australia release, again everything seems ok, but nothing has been signed yet. So, as soon as the contracts have been signed, we will let you know. 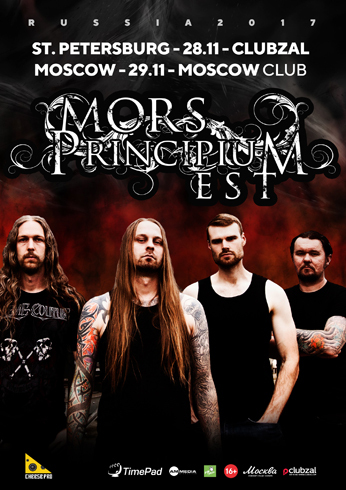 We’re proud to announce the signing of one of Finland’s finest Melodic Death Metal bands: Mors Principium Est. With their first three albums they left a mark on today’s metal scene and amazed fans and critics alike with their fast-paced and atmospheric mixture. With their new album they want to continue where they left off and even take their unique style to the next level. We have 2 new t-shirts available, so go check them out and BUY! 29.9.2011 THE SECOND GUITAR PLAYER! We found the second guitar player!! And the new guy is Andhe Chandler from New Zealand. Yes, New Zealand is pretty far, but don't worry, it will not affect our gigs in the future. Now we can concentrate on the new material with full force! All right sweethearts, time for an update. A lot of you have been asking how are things going and do we already have something new done. Well, things are going quite smoothly and we thought that, what if we upload one short, a bit over 1 min long, demo sample/teaser from one of our new songs for you guys to listen to. We will upload the song to our myspace account and that will be the only place where you can hear it, officially. Also, the song will be uploaded at friday the 29th of july. So, don't forget to visit our myspace account and listen to what the new MPE sounds like. Alrighty then, let's make it official. Our new guitar player is Andy Gillion from United Kingdom. Welcome to the "family", bro! We are still searching for the player number 2. So, keep on sending us those applications. Small update about our situation. I think we got about 100 contacts from guitarists all around the world and new contacts comes everyday. And now to the really cool part of this update. I THINK WE ALREADY FOUND 1 NEW PLAYER!!!!!!! We do not publish any names yet, but so far it looks pretty darn good! So, it really starts to look that this is not the end of Mors Principium Est. We will keep you updated, when there is something to update. 10.3.2011 Update + SEARCHING FOR GUITAR PLAYERS! Ok, so it's a time for a small update. To be honest, things are pretty bad. Our guitar players feel, that MPE is not something they want be part of anymore. If we still want to continue with MPE, we need new guitar players. This is our LAST try to make things happen. If it does not work this time, or we don't find the right person/persons, then it's game over for MPE. So, if you are, or know somebody, who is at least 21 years old, willing and able to write and play death metal with melodies and also would like to be a part of the new MPE, then send us an email. YOU CAN BE FROM ANYWHERE. As long as you are eager and get something done, then you may be the one we are looking for. AND we are looking for 1 or 2 players. Soo, if you have what it takes, send us an email and we will talk more. And just to make things 100% clear. You can live, for example, in USA, Germany, Sweden, Australia, Finland or where ever. so there is nothing we can do about it. So, as the subject says, we have 2 endorsement deals. First, our guitar hero Tomy Laisto is endorsed by IBANEZ. So, from now on Tomy uses exclusively IBANEZ guitars. Soo, from now on MPE will use exclusively CustomDrumSticks.BIZ drumsticks. Mikko will have his first signature sticks to use soon! We will have a brand new t-shirt coming up for sale soon!! Yeah yeah, it's been a while since last time updated, but there hasn't been anything to update. We are writing new material. Have been writing for a long time allready, but it's not so easy to get something ready. Couple of songs are kinda ready music wise, but no vocal parts yet. And this is especially for those people who are asking are we still alive or not and when is our next album coming out. Well, I don't want to sound rude, but if a band still has gigs to play, doesn't that mean that the band is alive??? I will not promise anything, because I can't. I really don't know when do we have enough songs ready and also once we have about 4-5 songs ready, then we will start to negotiate with various record labels and that also may take a while. Sooo, IF we are really lucky, we could have a new album out at the end of the year 2010, but I personally think, that 2011 sounds more realistic. But like I said, I can not promise anything. We'll just have to wait and see how things go. So finally, after years of waiting, we got our new and improved homepage up and running. Some pages are still under construction, but still. And then some other news. We are writing new material as we speak, but things are moving slowly. Maybe a bit too slowly, but we do not want to release anything that we feel are not worth releasing. We are also really waiting for our gig in Austria in August! It is our first time in Austria and we hope to see a lot of fans there. It will also be our new guitar players first gig as a member of MPE! Anyways, until next time - see ya!